Pollard, who was leading the side in the absence of Rohit Sharma, hammered 83 off 31 balls to seal a sensational win for the hosts. 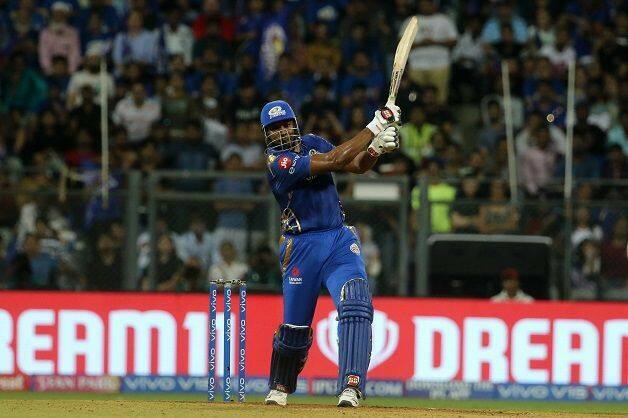 KL Rahul’s unbeaten hundred, Chris Gayle’s 36-ball 63 and Mohammed Shami’s three-wicket haul went in vain as Kieron Pollard – leading from the front – pulled off a heist, with a help from Alzarri Joseph, to power Mumbai Indians (MI) to a sensational three-wicket win over Kings XI Punjab (KXIP) in the 24th match of the Indian Premier League (IPL) 2019 at the Wankhede Stadium in Mumbai on Wednesday. Chasing 198, IPL debutant Siddhesh Lad set the ball rolling hitting a six and a four on his first two balls. Quinton de Kock too hit two fours in the third over as MI raced to 28 by the end of the third over. However, Mohammed Shami broke the opening partnership as he dismissed the right-hander with a yorker. Pollard though counterattacked even as KXIP managed to run Ishan Kishan out. The big-hitting West Indian, who was leading the side in absence of Rohit Sharma, took on his counterpart as Ashwin and Curran and brought down the equation to 70 off 36 balls. Hardus Viljoen and Shami pulled back the things for KXIP. 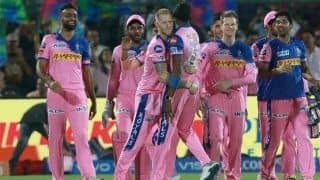 While the former did not get a wicket, he conceded just seven runs in the 16th over before the latter dismissed the Pandya brothers – Hardik and Krunal – in the 17th over to push MI on the backfoot, needing 54 off last four overs. Pollard though kept the hosts alive as he went after Curran in the 17th over, hitting the Englishman for two sixes to bring up his first fifty of IPL 2019. 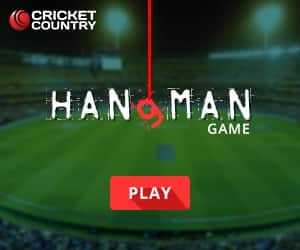 The West Indian once again went after Curran in the penultimate over, hitting him for two sixes and a four to bring down the target to 15 in the last over. 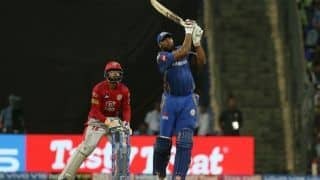 Earlier, after electing to bowl, MI managed to keep KXIP openers – Rahul and – in check as the first three overs yielded only 11 runs, Rahul hit a six in the fourth over before Gayle cut loose in the next, bowled by Jason Behrendorff, hitting three sixes and a four as KXIP upped the ante. KXIP brought up their fifty in the powerplay before Rahul launched into the attack, taking on Alzarri Joseph as the seventh over brought in 13 runs for the visitors. There was no respite from the other end as Gayle then went after Hardik. 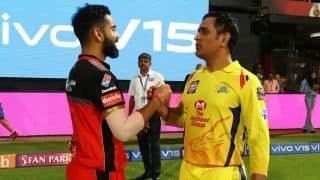 The Indian all-rounder conceded 17 in his first over, with the West Indian hitting a six and two fours in the ninth over before bringing up his fifty and team’s hundred in the 11th over. 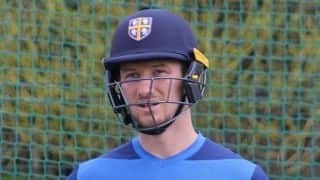 However, just when it looked that Gayle will inflict further damage, Behrendorff dismissed the left-hander for 63 in the 13th over after he failed to clear Krunal Pandya at the deep mid-wicket. 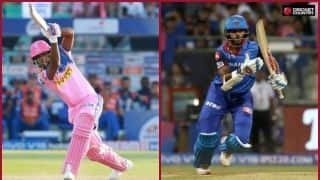 Gayle’s departure not just stemmed the flow of runs but also helped MI scalp two quick wickets as Hardik removed Miller and Karun Nair in quick succession. 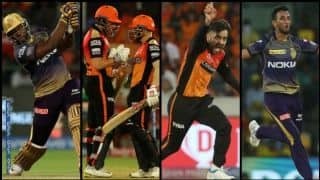 While Rahul, who brought up his second successive fifty, stayed put, KXIP lost another wicket as Jasprit Bumrah joined the wicket-taking party by sending Sam Curran packing for 8. Rahul then took the matters in his own hands and Hardik suffered. 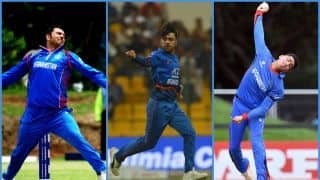 The right-hander struck three sixes and a four in the 19th over as Pandya, who went for 25 runs in his final over, ended up conceding 57 off his four overs. Rahul brought up his hundred in the 20th over as KXIP scored 197 after put in to bat. Earlier, Lad made his IPL debut and replaced Rohit in the playing XI, KXIP, meanwhile, made two changes to the playing XI, with Karun Nair replacing injured Mayank Agarwal and Mujeeb Ur Rahman making way for Viljoen.